We humans have loved sporting events since before there was a civilization. It’s no surprise that we’ve built huge gathering places in which to watch sports together. While the world loves sports, Americans do especially. 80% of the stadiums on this list are stadiums built on American college campuses meant primarily to host American football games. The MCG, or simply “The G,” as it is known to Aussies, is the largest stadium in Australia and the largest cricket ground in the world. 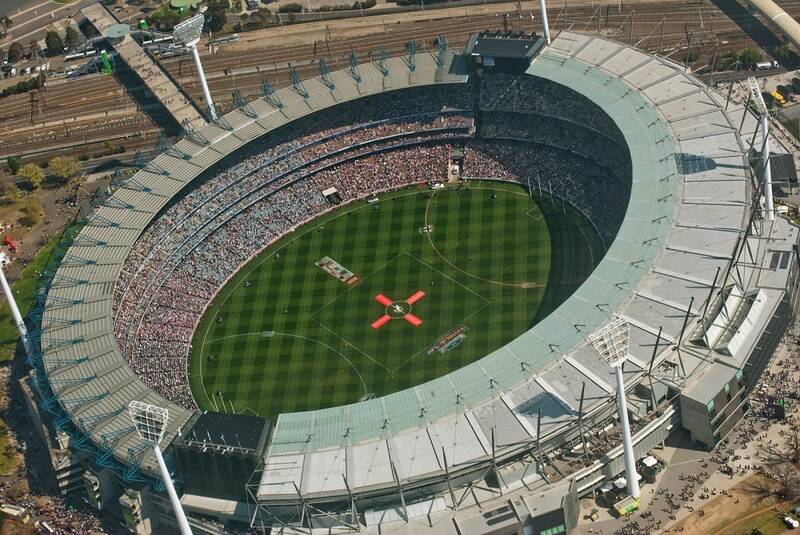 The stadium has come a long way from the 6,000 seat wooden stands the grounds accommodated in 1861 when the members-only Melbourne Cricket Club first opened to the public. The MCG has undergone renovations and extensions several times since 1853, the first year that batsmen took to the pitch. After the 1956 upgrade, the stadium was – and would still be – the largest stadium in the world in capacity, having hosted over 120,000 fans to an Australian Rules Football game. Today, after further upgrades, the multi-use stadium seats fewer patrons far more comfortably with all the modern sport amenities. 143,000 people squeezed into the venue to see the late Reverend Billy Graham in 1959. Prior to 1923, the University of Texas Longhorns played football on Grant field, a small ground when the school’s athletic director proposed a new concrete stadium. At a cost of 4 million USD in today’s money, students and alumni funded the Memorial Stadium. The stadium seated 23,000 then, and has grown incrementally as interest in the sport and the success of the Longhorns increased. The latest addition of seats in 2009 brought the capacity to its current level, the second largest in the state. 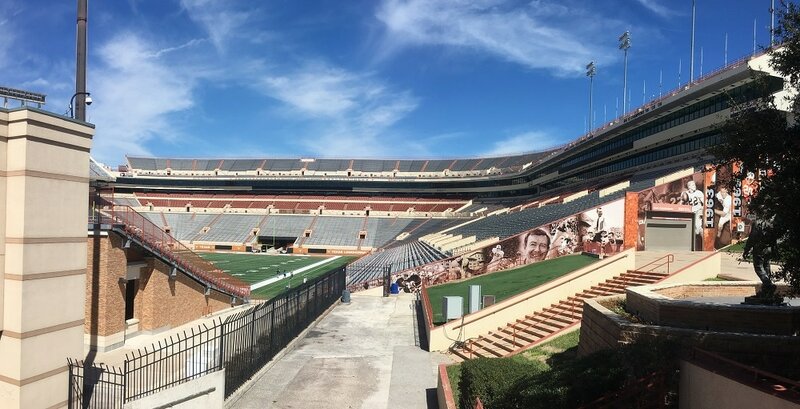 The university renamed the stadium in honor of former football coach Darrell Royal, who flew planes in World War II and returned to coach the Longhorns to several national championships. Until 1929, the University of Alabama played their games at Denny Field when the school built a 12,000 seat concrete stadium. They could only fill half of the seats for the first game. That changed as the school’s football program became more successful. The school added seats and amenities through 2011. The stadium was named Denny Stadium, after the school’s president in the 1920s until the school decided to add the name of its legendary football coach Paul “Bear” Bryant. He was still coaching at the time, one of a handful of coaches who worked in a facility that bore their name. He passed away 28 days after he coached his final game. 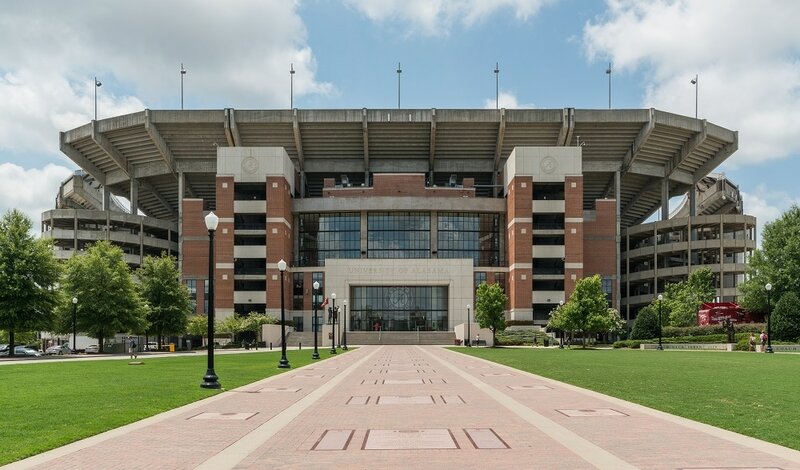 The school’s football team has won 80% of the games they have played in Bryant-Denny. Like most stadiums on this list, Tiger Stadium rose from humble beginnings as a relatively small field with a few wooden bleachers to become a giant arena that seats over 100,000 people each weekend in the Fall. However, Tiger Stadium added a twist during its expansion period. In the late 1930s, when the sports department wanted to expand the number available seats, the school could only convince the Louisiana state government to approve funding for new dormitories for the students. So then, the school’s athletic director came up with the idea to build student housing into Tiger Stadium. Students actually resided in the stadium up until the late 1980s when the dormitories were converted into office space. 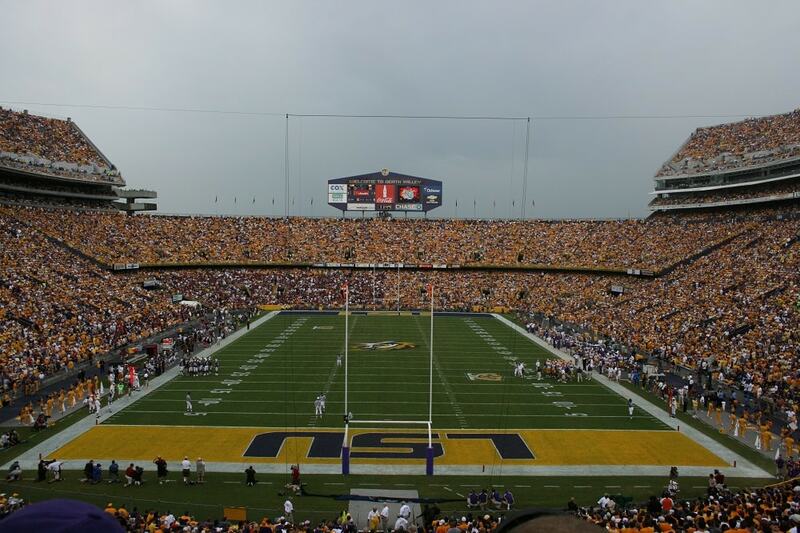 Tiger Stadium is one of two college football stadiums that carry the nickname “Death Valley.” It’s so named because of how difficult it is for opposing teams to play against the Tigers when in Tiger Stadium. Another giant football stadium in the Southeastern United States, Neyland Stadium is the home field of the University of Tennessee Volunteers. As with other schools, the football team played on a small field until the 1920s when a new stadium appeared. In Knoxville, a local banker funded the initial project, which soon ran out of money. Students and faculty stepped in to finish the modest 6,200 seat stadium. In 1962, the school decided to rename the stadium after a former football coach to coincide with another expansion project and Neyland Stadium was born. 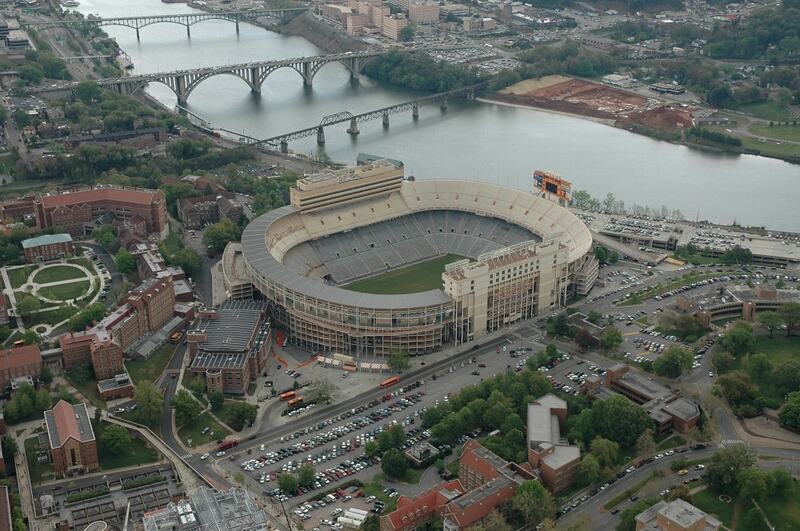 Neyland Stadium overlooks the Tennessee River. Hundreds of fans take their boats to a nearby pier as a means of traveling to the football games. While other stadiums may have had modest beginnings, Kyle Field’s origin story is even more humble. One professor built the entire football field in 1904 using his own money to provide benches for 500 people to observe football games. That professor was Edwin Kyle and his name has survived the many upgrades and additions the school has approved for the stadium ever since. The most recent seating capacity upgrade would have made the stadium the third largest in the country. However, the planners chose functionality over capacity. 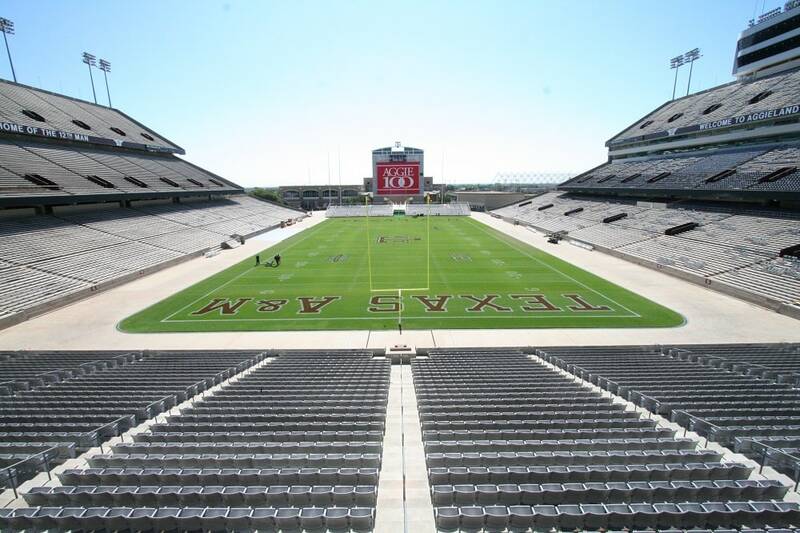 Kyle Field hosted the most attended football game ever played in Texas when the Texas A&M team played the University of Mississippi in 2016. Over 110,000 fans attended. American college football fever isn’t only afflicting people in the Southern part of the country. The Midwest has a long tradition of interest and success in the game and has the massive stadiums to prove it. The Ohio Stadium has been home to the Buckeyes football team since 1921 when the first version of the arena opened, seating 25,000. In the last round of improvements, private donors and the athletic department paid 194 million USD, unlike many government run institutions in this list, where public funds make up a sizable part of the funding. The athletic department at OSU is a separate institution from the school. 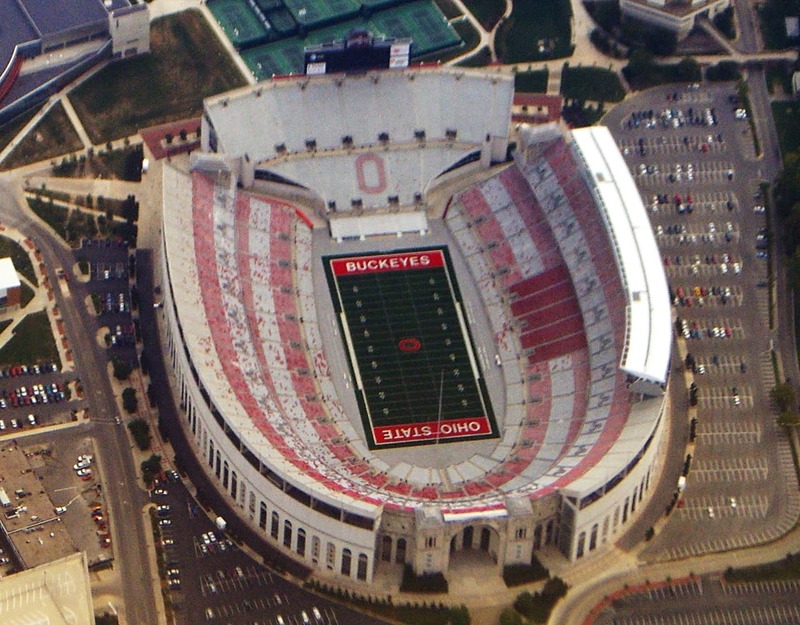 Ohio Stadium is unique for a venue of its size in that it is not fully enclosed. Whereas most stadiums are in an oval, the southern end of the stadium is open, giving the stadium a horseshoe appearance. The first game ever played in America’s professional soccer league, Major League Soccer, was played in Ohio Stadium. In 1909, the school built the New Beaver Stadium, named after the school’s president. The school moved the stadium to a different part of the school with a completely new building in 1960. That stadium seated just over 46,000 fans. 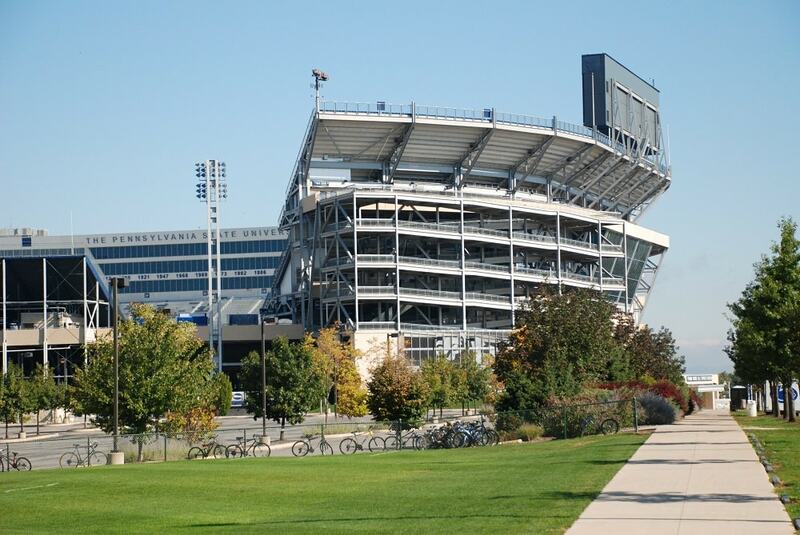 The stadium’s expansion mirrored the rise in achievements of the school’s football team under coach Joe Paterno (1926 – 2011), who began his tenure there in 1966 and coached until scandal forced his ouster in 2011. While many amenities and luxuries have been added as well as additional seating, the school hopes to build a complete replacement of Beaver Stadium by the year 2030. You can view the interior of Beaver Stadium on Google Street Maps. It was the first stadium to be featured. 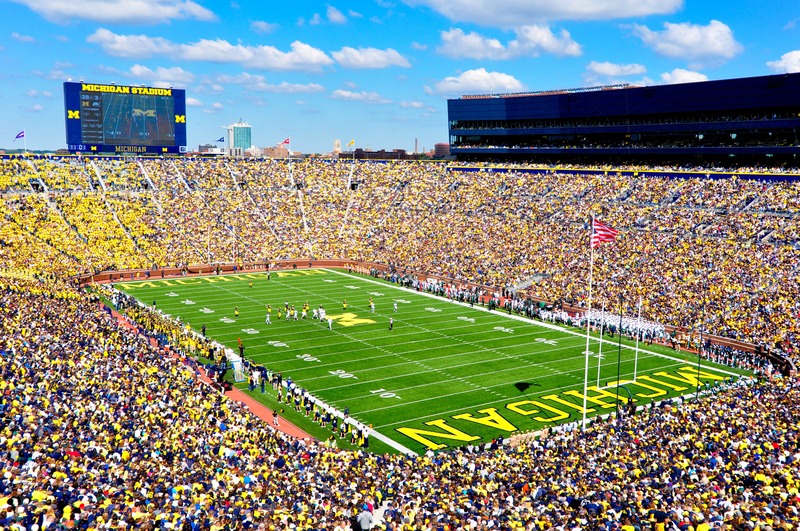 The largest stadium in the United States is located in Ann Arbor, MI, where the Michigan Wolverines play their football games. Whereas many schools in this list started small, Michigan entered the playing field with a 72,000-seat stadium back in 1927. Even before the school built Michigan Stadium, the Wolverines played at the 40,000-seat Ferry Field, far larger than most schools of the day. The school tried artificial means to increase capacity like adding temporary bleachers, but decided a new stadium was necessary, and replaced Ferry Field with the current stadium. Fans and students of the Michigan football team call their stadium “The Big House,” yet few can agree where the tradition began. Many attribute the nickname to a sports announcer, the late Keith Jackson. As popular as soccer is worldwide, it may be rather surprising that there aren’t more soccer stadiums among the top-ten largest in the world. However, North Korea’s May Day Stadium, primarily a soccer venue, is the largest stadium in the world. The official word from the North Korean government is that the stadium, also known as the Rungrado Stadium, seats 150,000. Other estimates put the maximum capacity closer to 114,000, a number that would not change its status as the world’s largest. In 2015,the government completed an update of the stadium’s interior to mirror the flashy football stadiums found in Europe. 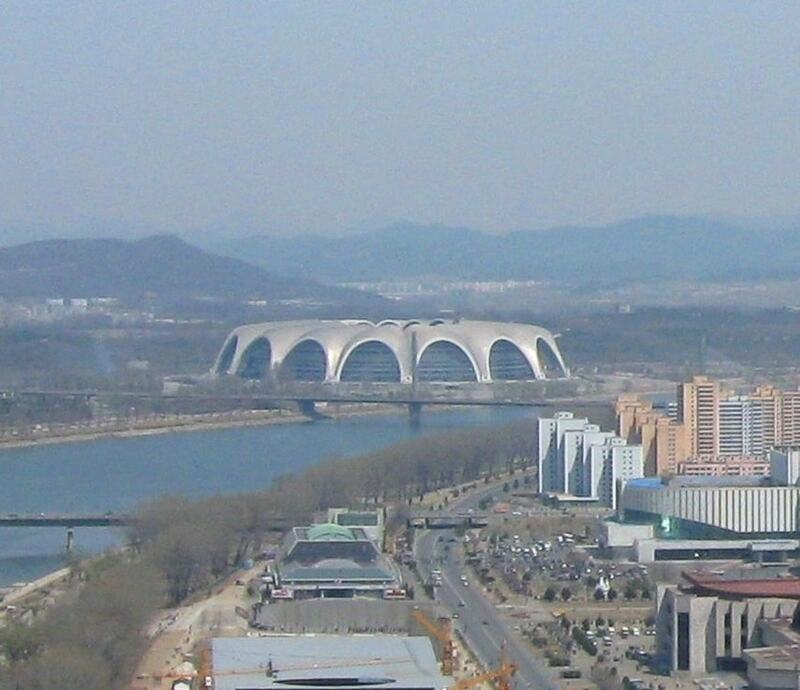 May Day Stadium sits on an island in the middle of Pyongyang. There are only two roads leading on and off the island.